“That was a pretty awesome book!” were my first thoughts upon finishing Pivot Point. As the ending of the story approached, I think I found myself getting geared up to find out the conclusion with “edge of my seat” intensity. Because as we continued to follow both of Addie’s potential paths, it starts to become quite apparent that her ultimate choice will be a lot more heartbreaking than even she would have ever suspected. On that note, I just wanted to point out how much I loved the cohesiveness of the storyline despite the fact that we’re living out two different stories in a simultaneous timeline at the same time. The alternating back and forth between both of Addie’s paths was an interesting way to narrate the story. In this way, we get to live out both decisions alongside Addie and see the entirety of her situations--kind of like a compare and contrast type of deal. At first, I wondered if this wouldn’t get confusing or be too hard to follow, but the narration proved to flow extremely well, even inserting simultaneous events that would occur in certain points of the timeline, but from different perspectives of Addie’s futures. We, as the reader, saw exactly what was going on on both sides, and had knowledge that Addie did not have due to the situation of her chosen path. I think it was pretty amazing that the narration was so successful. The summary blurb of Pivot Point doesn’t quite do the book much justice. I mean, while the story DID start off a little too "teenage drama" for my liking, the rest of the telling become one big gripping, yet feel-good tale involving both a girl’s contemporary life with a side-dish of the paranormal/sci-fi, and an intense murder mystery hanging in the background like a bad omen. Which is interesting considering I'm not even quite sure what categories to use in describing this book: paranormal? sci-fi? fantasy? mystery? thriller? feel-good romance and contemporary? But the actual story that ended up presenting was so much more than just that dinky little romantic aspect that young girls love to follow. There was definitely a lot of thought put into the entire story outside of simple teenage drama fests. In a sense, the entire story altogether was pretty amazing. Ultimately, Addie’s final decision would affect so much more than what she’d bargained for. And in a way, it’s kind of heartbreaking, but at the same time, I had so much enjoyment with this book. 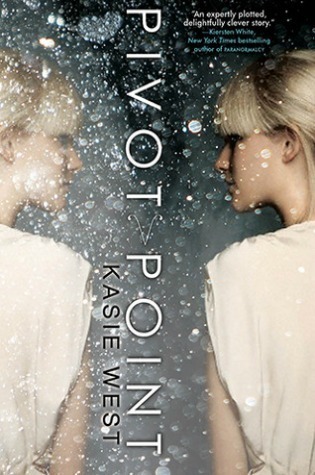 What I also ended up loving about Pivot Point were the characters as well as the little hidden world of the Compound. Hidden worlds are one of my more favored plot devices--add into it several fun and relatable characters and I’m loving every moment. Addie started off a little bit annoying, but at the same time she had a really witty voice to follow despite her cynicism about herself--the fact that, even though she spent so much time moping about her parents’ divorce, she still remained rather grounded to reality kept me on-board with her every step of the way. She was dramatic as all teens usually are, but at the same time, she acknowledged the fact that she was taking out her frustration on the situation like a rebellious teen would (all with her “Handbook of how people should act” floating around in her imaginary library). She is a total nerd with her over-analysis of situations and that’s what got me relating to her from beginning until the end. The entire cynical “I’m a plain and boring Jane” spiel when Addie is obviously a witty, intelligent, beautiful young girl really kicked the nuts a little, but I forgive her for that just because she still keeps it pretty real. Character interaction, humor, gripping mystery... This really made for an exciting and fun read with some exclaimed “Awesome!”s tied into it as well. This review was originally posted at Ani's Book Abyss / BookLikes in September 2013.